Last evening, I photographed in five different locations, using available lighting. This wide angle scene was taken in a small bar, before it became overcrowded. 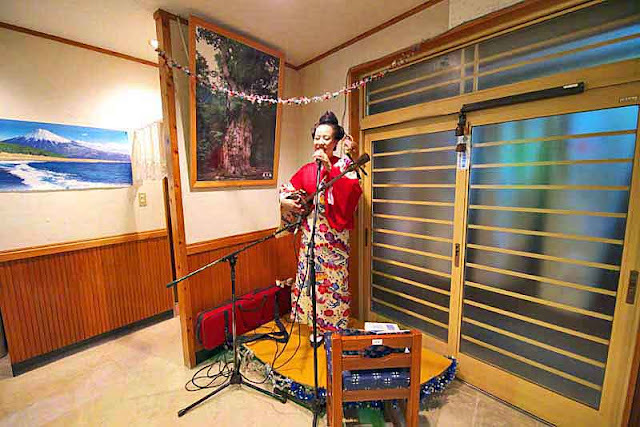 The gal, on the stage, sings Okinawan folk music, known as mineo. It's a one person act, until someone decides to join in and sing, while she plays the sanshin. The event, called the Ushina Live Matsuri, began at 6:PM . Around six, I left the office and walked to Ushina, to arrive a few minutes early. By midnight, I returned, with over 500 images and, just locked-up the camera. After watching all the entertainment, it was my turn, to go and do some partying. Crazy things happen, out in town, this time of year, when you go out late. Lots of companies, have end-of-the-year parties, called bonenkai. Some young lady came over and started petting my beard and, saying, it smelled good. So, I figured the best thing to do, would be drink lots of beer and, catch-up with everyone. This morning, when I woke up around nine, the wife asked me, what time I got home. She said, she found me asleep, on the kitchen table, at 5AM. Maybe, I was hungry. Somehow, I wound up, going to my room and, slept there, I guess. Then, had to walk all the way back to the kitchen, for breakfast. Groan. When I've been drinking, looking at clocks, doesn't make any sense, to me. The best way, to see, what time I got home, is to ask a bartender. They know stuff like that. It turned out, to be a long day of processing photos. Rainy and cloudy. About 50 images, were loaded to a Facebook album Ushina Live Matsuri 2016. This photo was special because, that's one heck of an act, singing and strumming. And, she didn't go around stroking old guy's beards ! What's Better Airbnb or a Capsule Hotel ?